"One of the best screen recording and editing programs." 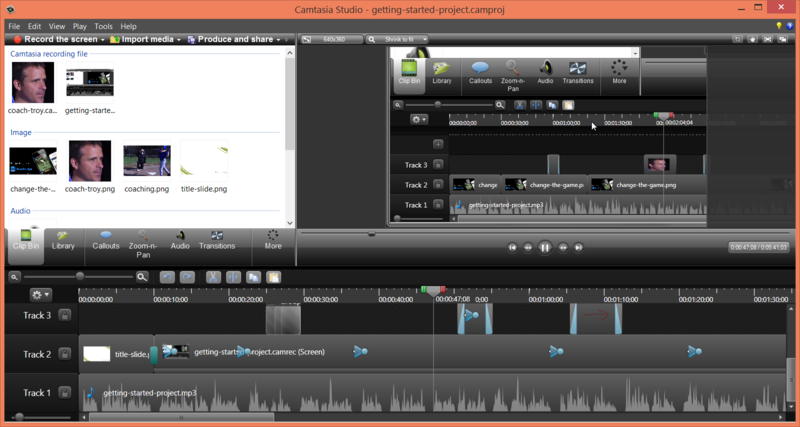 Make creating your video tutorials a lot easier with Camtasia Studio. Not making video tutorials? That's okay. Camtasia can handle all of your screen recording needs, no matter what they are. Take your videos past simple screen recording. Add music, videos, pictures, and voice over to truly customize your videos before sharing them. With Camtasia's feature filled video editor, you can easily add professional or fun transitions, effects, animated bakcgrounds, and graphics to your videos. Make your videos interactive with clickable links, table of contents, and more. With Google Drive integration, Camtasia allows you to get your videos to your viewers faster and easier. You can also import videos from Google Drive straight into Camtasia. Camtasia has many professional tools that you would not expect from a screen recorder application. Put yourself into your videos with Camtasia's chroma key feature. Edit your videos faster with the Crop, Stitch, and Copy tools. Use the Crop function to focus on a specific area on the screen and defocus everywhere else. Stitch clips together so that you don't have to reapply effects over and over. Copy effects from one clip to the next with the Copy function. Camtasia also has built in quiz creation so that you can quiz your viewers after the video has completed allowing you o obtain much needed feedback. One of the most important aspects of your video production is sharing your work. Utilize Camtasia's Production Manager to ensure that you will be sharing your video the right way and in the right format.